Your chance to win one of our new Chocolates umbrellas. Visit Umbrella Heaven on Facebook to find out how. This offer no longer applies. The lucky winner of our Lisbeth Dahl “Evelyn” umbrella prize draw is Nadine-Rosie Homer from Kenilworth. Keep Dry. It seems like it’s been more than a couple of weeks however… today the boss picked out the of name our winner. We need to get her permission and contact details before we publish her name. Now you might have noticed it’s a “her”. Strangely the “Evelyn” umbrella seemed more popular with the girls than the chaps. The tastiest umbrella around?It’s time to meet the newest and tastiest creation from Umbrella Heaven… Ladies and Gentlemen I’m proud to introduce the Yumbrella!! 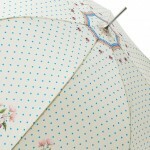 Unfortunately we no longer stock this umbrella. Click here to visit our shop page! Want to try growing your own this year? NEW Rose Jack Umbrella. Made by Fulton, this umbrella really is compact. Packs away to just 6cm x 3cm x 16cms long. It does actually make perfect sense. There are times when a picture really is worth “several” words… Unfortunately we no longer stock this product. Click here to browse the rest of our range! All you need to do is visit the Umbrella Heaven Facebook page, share and like the post and you’re in with a chance to win one of these gorgeous umbrellas. Click here to browse our range of quality umbrellas and more!